If you would like to get in contact with us.. please click here and we will get in contact with you as soon as we can. I tried twice with your affiliate link. I am not getting the $67 offer for 5 weeks. I tried with 2 separate email ids with 2 separate ips and both are new accounts. Is the offer still available or taken down? Yes the offer still available. You have beem signing up for the 7day trial. You need to sign up for $67 upfront and (still get 37days refund period) and then it will go to $127 after. 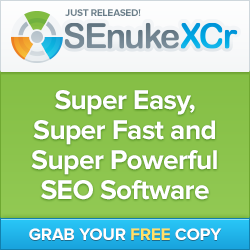 Watch the video on the first page -> http://www.senukedeal.com/ it will show you how to go about it. I have tried several different emails, browsers, clearing cookies and cache and following the directions specifically and I cannot get to the page referenced in the video. Is this offer no longer available? Should I stop trying? Please let me know, this is very frustrating, and I am not selecting the 7 day trial as you have said to another comment. My question to you, once the new Senuke X version hits the market, and in case I benefited from your offer, at the time for the upgrade would I still be paying the same monthly fee of USD 147 or I would need to pay the new rise in the monthly membership fee reflected in the version update? I have a webiste design firm. Can this one product be used for my cliets. Also what is your phone number? Can’t find the offer on the SE Nuke site – is it still available? Hello…been trying to contact you..is this offer still good? please email me for details…I want to try the full SE NUke package, monthly payment..
How much is SENuke after the $67 for 5 weeks? How many projects/websites can I promote?